An architect-designed villa with infinity plunge pool and mesmerising sea views, all within walking distance of a sandy beach. 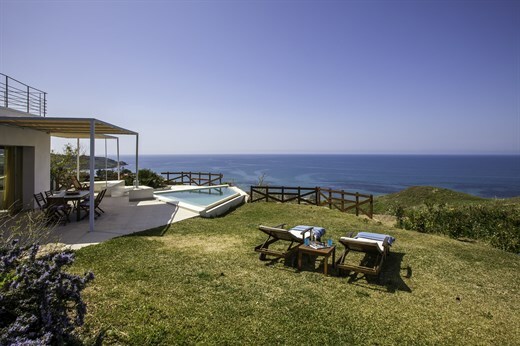 San Marco occupies an enviable panoramic position above a long sandy beach. Its clean lines, contemporary light-filled interiors and alluring al fresco areas make it a highly attractive proposition for an unforgettable family holiday. ³ at the end of April a couple of bars open up on the beach below the house, serving refreshments and light meals from breakfast to dinner. They also serve late afternoon aperitifs/sundowners with music. On Friday and Saturday nights (and occasionally on Sundays) from June to the end of August they also run a late-night disco on the beach. Inside: accommodation at San Marco is on two floors. The main entrance takes one in to an open-plan living area and a hi-spec kitchen. The white walls and light grey polished concrete floors are lit up by a series of large glass doors that open onto the outdoor terraces and bring in the views, creating an airy, luminous and calming atmosphere. Whether you're lounging on the sofa or rustling up lunch, you'll get to look at the sea. Stairs lead from the living area up to the first floor and the sleeping quarters, which comprise a double bedroom with large panoramic terrace, a double-twin also with terrace and a second double with access via a walkway to the surrounding gardens. All three bedrooms boast superb sea views and sleek en-suite shower rooms. Outside: San Marco sits in a generous plot of land, which is planted with olive trees and a large variety of fragrant Mediterranean flora. Immediately outside the indoor living area is a fabulous shady terrace, furnished for lounging and dining, served by a great built-in barbecue and delimited by vibrant green lawns. The terrace leads to the panoramic infinity plunge pool and a sun-soaked solarium from where the sea views just keep coming. Two of the bedrooms have their own panoramic terraces but the view to beat all other views is from the roof-top terrace, the perfect spot for a aperitif as the summer sun melts into the sea. Last, but certainly not least, a track leads from the gardens down to the long sandy beach below the house (approx. 10-minute walk) where you will be able to dive into the azure waters of the Mediterranean or take advantage of a couple of beach bars serving refreshments and light lunches and renting out kayaks and other water sports equipment. At the end of April a couple of bars open up on the beach below the house, serving refreshments and light meals from breakfast to dinner. They also serve late afternoon aperitifs/sundowners with music. On Friday and Saturday nights (and occasionally on Sundays) from June to the end of August they also run a late-night disco on the beach. San Marco features a fantastic infinity plunge pool, offering swimmers stunning views while in the pool. There is a drop from the infinity edge so we recommend children are supervised at all times. Please refer to our general safety page if you would like more information about infinity pools. San Marco is situated just a few kilometres west of Sciacca, a working fishing town with a well preserved and fascinating historic centre and some excellent shops and restaurants. Sciacca was founded by the Greeks in the fifth century BC, when the residents of Selinunte made use of its hot thermal springs as a spa. There are several thermal spa complexes in and around the town where visitors can bathe in the hot sulphurous waters. San Marco is ideally placed for visiting the fascinating Greek archaeological sites of Selinunte (to the west) and The Valley of the Temples in Agrigento (to the east). The coast around Sciacca is sprinkled with excellent sandy beaches and those around Porto Palo-Menfi (just to the west) have received 13 consecutive "Bandiere Blu", attesting to the cleanliness of the water and their general ecological excellence. Driving west past Sciacca, one soon comes to the long sandy nature reserve beaches of Torre Salsa and Eraclea Minoa and the stunning white marl cliffs and beach of the Scala dei Turchi. If you're looking to explore some of Sicily's historic towns and cities, Palermo, Trapani, Marsala, Mazara del Vallo and Erice are between 1 hour and 1.5 hours' drive away. Cycling in the Sciacca-Menfi area is a very pleasurable pastime, thanks both the quiet back roads and a purpose-built cycle track along the old railway line between Sciacca, Menfi and Porto Palo. "Overall, San Marco is an excellent property with memorable views. The easy access to a pleasant beach added to our enjoyment." We had a fabulous time at San Marco, it exceeded all our expectations! Overall, San Marco is an excellent property with memorable views. The easy access to a pleasant beach added to our enjoyment. San Marco was excellent and as advertised. The service was spot on. San Marco is simply outstanding. We did not expect to see such a place in Europe. It is very modern in a style that we really like.We really enjoyed our holiday, and there are no negative things to mention. Everything went really fine. Well, we left San Marco saying that we will seriously consider a return visit next year - but for a fortnight! A quiet villa with spectacular panoramic views but a few minutes from good beach and added bonus of the beach bars - we started most evenings down there with a prosecco.